"It's controversial - and it's becoming more controversial every minute," said Prof Torsten Oppelland, from the University of Jena. For the first time since the fall of the Berlin Wall in 1989 a German state has a far-left prime minister. Bodo Ramelow is from the socialist Die Linke - the "left" party. It is the democratic descendant of the communist party which governed old East Germany. 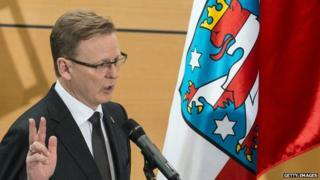 On Friday Mr Ramelow won a second-round vote to become leader of a coalition in the state of Thuringia. It is called "Red-Red-Green" - Die Linke with the Social Democrats (SPD) and the Green Party. Die Linke has been represented in other regional governments, but this is the first time one of its politicians has led one of Germany's 16 states. And that, Prof Oppelland says, is "really emotional for Die Linke, because it symbolises their success story and recognition in the political system". "On the other hand it's very emotional for conservatives, or those who experienced persecution in the DDR [former East Germany]," he adds. At Erfurt's Christmas market, Ellen tells me: "It's time to try new ways." She is partially obscured by the clusters of carved wooden decorations. People pause, Gluehwein in hand, to admire the intricately patterned stars that hang on ribbons along the front of the stall. But few of the tourists in the bustling market under the gothic spires of Erfurt's cathedral are aware of what many here describe as an historic moment for this state. Thuringia is conservative country. But, as of today, that has changed. Critics of Die Linke accuse some members of having former links to the Stasi - East Germany's secret police. And the Thuringia coalition was agreed on condition that the new prime minister acknowledged that former East Germany was an "Unrechtsstaat" - an unlawful state. It is an emotive admission for the party, not least because the same word is applied to Nazi Germany. Die Linke describes itself as a party which stands for alternatives, for a better future. It wants to scrap Nato, ban fracking - controversial shale gas extraction - and supports the introduction of a minimum wage. And it is still regarded with suspicion by the political mainstream. Controversially, Germany's President Joachim Gauck warned voters in Thuringia against Die Linke. So did Chancellor Angela Merkel who, like Mr Gauck, grew up in East Germany. "Karl Marx is to be carried into the offices of government," she said. In fact Marx featured prominently on the campaign trail for Bodo Ramelow, who regularly spoke in public alongside a bright red bust of the author of the Communist Manifesto. But Mr Ramelow attributes Die Linke's success at regional level to practical rather than ideological reasons. Mr Ramelow, 58, is a former trade union official from the west. "It's the Heimatgefuehl," he told the BBC, referring to the German concept of emotional connection to one's home. "And it's also the principle of care." He has pledged to improve schools and roads. It was the promise of free kindergarten places that won over a young mum I met at the Christmas market. Melanie cannot get her daughter Keira into a nursery until February because of a shortage of spaces. Keira's grandmother stood close by. "It's good to bring in change," she said. But Robert, supervising his staff rolling out dough for pretzels at a nearby stall, was furious. "It's terrible that this man's come to power. Where are they going to get the money from for these policies? By taxing small companies like mine!" he said angrily. "The socialists are not competent at economics." Certainly the central government in Berlin will be watching closely. Angela Merkel's conservatives govern in coalition with the left-wing SPD, the same party which - at regional level - has now joined with Die Linke. Few believe what has happened in Thuringia would work at federal level. The left-wing parties simply differ too much over foreign policy, for example. Nevertheless, the situation is "playing right into the hands of Alternativ fuer Deutschland (AfD)", says Dr Patricia Hogwood from the University of Westminster, referring to Germany's new populist anti-euro party, which campaigns for tighter immigration. "It's making Chancellor Merkel take them seriously because that's the contingency approach for coalition." And under the sparkling lights of the Christmas market, I ask Ellen whether she would like to see Die Linke represented more substantially at national level. She smiles, rearranges a decoration. "Why not. The party's changed a lot. They should get a chance."